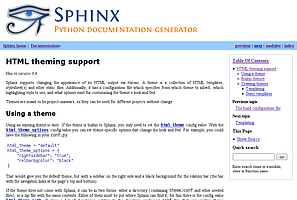 Sphinx provides a number of builders for HTML and HTML-based formats. Populate when the ‘builders’ document is split up. This section provides information about using pre-existing HTML themes. 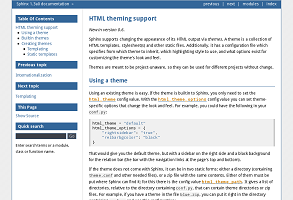 If you wish to create your own theme, refer to HTML theming support. 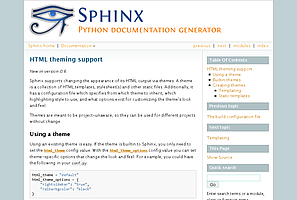 Sphinx supports changing the appearance of its HTML output via themes. 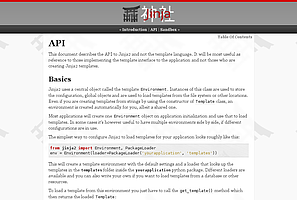 A theme is a collection of HTML templates, stylesheet(s) and other static files. Additionally, it has a configuration file which specifies from which theme to inherit, which highlighting style to use, and what options exist for customizing the theme’s look and feel. Themes are meant to be project-unaware, so they can be used for different projects without change. For more information on the design of themes, including information about writing your own themes, refer to HTML theming support. Sphinx comes with a selection of themes to choose from. nosidebar (true or false): Don’t include the sidebar. Defaults to False. sidebarwidth (int or str): Width of the sidebar in pixels. This can be an int, which is interpreted as pixels or a valid CSS dimension string such as ‘70em’ or ‘50%’. Defaults to 230 pixels. body_min_width (int or str): Minimal width of the document body. This can be an int, which is interpreted as pixels or a valid CSS dimension string such as ‘70em’ or ‘50%’. Use 0 if you don’t want a width limit. Defaults may depend on the theme (often 450px). body_max_width (int or str): Maximal width of the document body. This can be an int, which is interpreted as pixels or a valid CSS dimension string such as ‘70em’ or ‘50%’. Use ‘none’ if you don’t want a width limit. Defaults may depend on the theme (often 800px). Alabaster theme is a modified “Kr” Sphinx theme from @kennethreitz (especially as used in his Requests project), which was itself originally based on @mitsuhiko’s theme used for Flask & related projects. Refer to its installation page for information on how to configure html_sidebars for its use. rightsidebar (true or false): Put the sidebar on the right side. Defaults to False. stickysidebar (true or false): Make the sidebar “fixed” so that it doesn’t scroll out of view for long body content. This may not work well with all browsers. Defaults to False. externalrefs (true or false): Display external links differently from internal links. Defaults to False. footerbgcolor (CSS color): Background color for the footer line. footertextcolor (CSS color): Text color for the footer line. sidebarbgcolor (CSS color): Background color for the sidebar. sidebarbtncolor (CSS color): Background color for the sidebar collapse button (used when collapsiblesidebar is True). sidebartextcolor (CSS color): Text color for the sidebar. sidebarlinkcolor (CSS color): Link color for the sidebar. relbarbgcolor (CSS color): Background color for the relation bar. relbartextcolor (CSS color): Text color for the relation bar. relbarlinkcolor (CSS color): Link color for the relation bar. bgcolor (CSS color): Body background color. textcolor (CSS color): Body text color. linkcolor (CSS color): Body link color. visitedlinkcolor (CSS color): Body color for visited links. headbgcolor (CSS color): Background color for headings. headtextcolor (CSS color): Text color for headings. headlinkcolor (CSS color): Link color for headings. codebgcolor (CSS color): Background color for code blocks. codetextcolor (CSS color): Default text color for code blocks, if not set differently by the highlighting style. bodyfont (CSS font-family): Font for normal text. headfont (CSS font-family): Font for headings. The theme originally used by this documentation. It features a sidebar on the right side. There are currently no options beyond nosidebar and sidebarwidth. 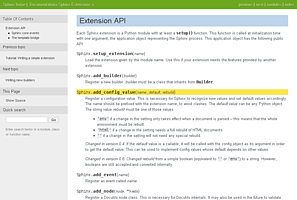 The Sphinx documentation now uses an adjusted version of the sphinxdoc theme. bodyfont (CSS font family): Font for normal text. headerfont (CSS font family): Font for headings. pagewidth (CSS length): Width of the page content, default 70em. documentwidth (CSS length): Width of the document (without sidebar), default 50em. sidebarwidth (CSS length): Width of the sidebar, default 20em. bgcolor (CSS color): Background color. headerbg (CSS value for “background”): background for the header area, default a grayish gradient. footerbg (CSS value for “background”): background for the footer area, default a light gray gradient. headercolor1, headercolor2 (CSS color): colors for <h1> and <h2> headings. headerlinkcolor (CSS color): Color for the backreference link in headings. textalign (CSS text-align value): Text alignment for the body, default is justify. A greenish theme. There are currently no options beyond nosidebar and sidebarwidth. 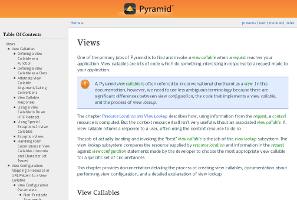 A theme from the Pyramid web framework project, designed by Blaise Laflamme. There are currently no options beyond nosidebar and sidebarwidth. full_logo (true or false, default False): If this is true, the header will only show the html_logo. Use this for large logos. If this is false, the logo (if present) will be shown floating right, and the documentation title will be put in the header. textcolor, headingcolor, linkcolor, visitedlinkcolor, hoverlinkcolor (CSS colors): Colors for various body elements. 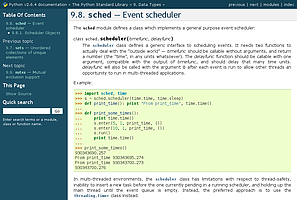 A theme resembling the old Python documentation. There are currently no options beyond nosidebar and sidebarwidth. relbar1 (true or false, default True): If this is true, the relbar1 block is inserted in the epub output, otherwise it is omitted. footer (true or false, default True): If this is true, the footer block is inserted in the epub output, otherwise it is omitted. New in version 1.3: ‘alabaster’, ‘sphinx_rtd_theme’ and ‘bizstyle’ theme. Changed in version 1.3: The ‘default’ theme has been renamed to ‘classic’. ‘default’ is still available, however it will emit a notice that it is an alias for the new ‘alabaster’ theme. There are many third-party themes available. Some of these are general use, while others are specific to an individual project. A section of third-party themes is listed below. Many more can be found on PyPI, GitHub and sphinx-themes.org. 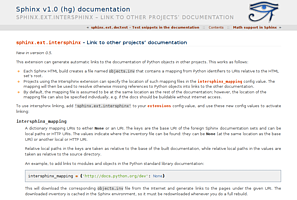 Read the Docs Sphinx Theme. This is a mobile-friendly sphinx theme that was made for readthedocs.org. View a working demo over on readthedocs.org. 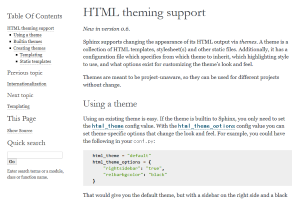 You can get install and options information at Read the Docs Sphinx Theme page. Changed in version 1.4: sphinx_rtd_theme has become optional.